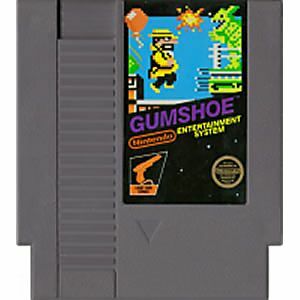 Gum Shoe original NES Nintendo Game cartridge only - Cleaned Tested and Guaranteed to Work! Cool game. Much more challenging than most zapper games. Arrived fast as always and in great condition for a good price. Lukie games is the best. Trop cool. Il faut tirer sur ton personnage pour lui sauver la vie ! Un retour en enfance garantie. Leave it to Nintendo to make a fun, kid-friendly light gun game. Combining a gallery shooter and a platformer, this game will challenge your Zapper skills starting from the very first level. In fact, if you are used to playing slower-paced games like Duck Hunt, you may find the very first level impossible to pass, since this game requires a faster shooting technique to destroy an entire avalanche of boulders dropping on your protagonist. The trick is to shoot without pulling the trigger all the way -- doing this lets you use the Zapper as a rapid-fire weapon, and also eases the strain of the shooting action, of which there is certainly no shortage here. Overall a fun title, but admittedly not for true beginners. i liked Gumshoe its hard at first but i like it because its different and you have to be patient and watch for flying objects to hit you and dodge them. My first gumshoe game didn't play but Lukies sent me another in a week and it plays well. I enjoy ordering games from Lukies i recommend you buy from them. I've had great friendly service from them. And they have good prices on their games. 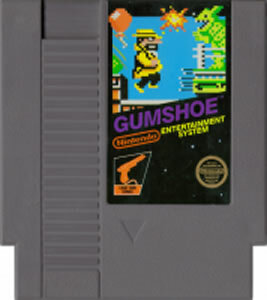 Gumshoe is a zapper game made by Nintendo. This one is weird as hell... What other game requires you to shoot your hero in order to advance? Never mind that though, because Gumshoe is actually a fairly fun game. As far as Zapper games go, it seems to have the most depth. Every once in a while I pop this one in, and see how far I can get in this difficult game. Its a cool game. You play as a detective to find your daughter who has been kidnapped by a guy named kingdom. You have to collect 5 black panther diamonds in 24 hours to see your daughter again. Again its a cool game. It requires the NES Zapper gun though.